Lots of people join a gym at the beginning of the year, then quit within a few months. 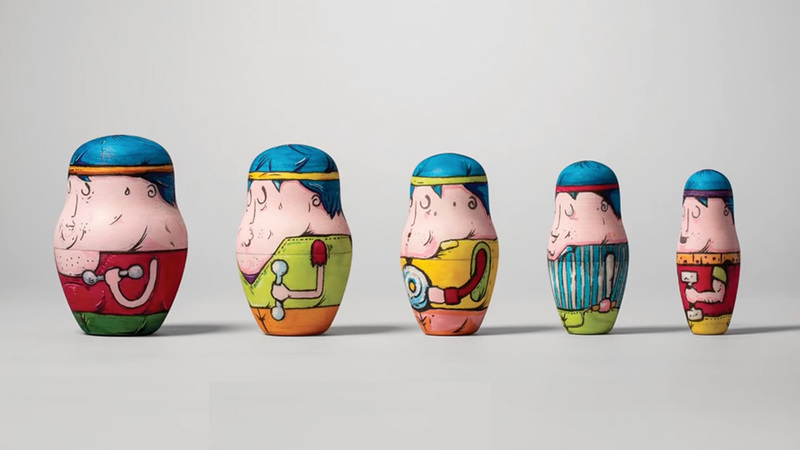 To keep customers coming back, CrossFit chain Brick and agency BBDO New York created a series of custom nesting dolls that illustrate the stages of progress that gymgoers will see if they stick with their fitness plans. Different version of these "Fit Nesting Dolls" track to different kinds of fitness goals—lose weight, prep for a triathlon—with a computer flash drive containing a workout routine located at the center of each set. All get consecutively thinner without losing much height. Various artists designed the iterations on the theme. The results are generally cute and diverse—though some of the largest dolls come off as comically unflattering, which also risks seeming mean-spirited. Made with a 3-D printer and handed out to new signups at Brick, the dolls also served as the centerpiece of social advertising and on-site posters. Layouts showing the succession of dolls side by side offered the clearest and most compelling version of the work. But most entertaining are the animations at the top of the promotional video above, wherein the dolls sprout arms and pump iron while making appropriately ridiculous faces. Overall, the idea is clever. And images of nesting dolls with cut abs are also pretty funny, especially in contrast to the traditional, more conservatively clad Russian iteration. Whether it communicates what Brick wishes it to might be a different question. Nobody wants to spend five months suffering at the gym to end up shaped like an oblong egg, no matter how ripped.